I created this for my SS on Splitcoaststampers for the Secret Elf Swap. Tim Holtz burlap frameTim Holtz distress paints, broken china,vintage photo, seedless preserves, and spiced marmelade. 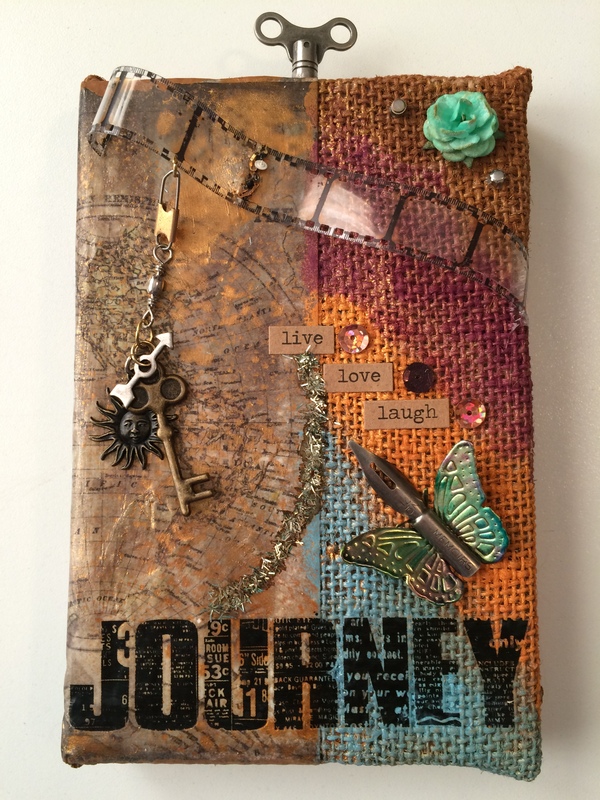 Paper was from Tim Holtz – Lost and Found, Journey was from Tim Holtz idea-ology Words, remnant Rubs, Tim Holtz Idea-ology Clock Keys, Tim Holtz idea-ology Chitchat, Tim Holtz Idea-ology Pen Nibs, Tim Holtz idea-ology game spinners and Tim Holtz Photo Tape. I really enjoyed creating this, I hope that this encourages you to try out the burlap frames. Created for the #10 Year Long Tag Swap on SCS, this tag was created using Julie Nuttings Prima Doll, Tim Holtz Butterfly border, Butterfly dies, Tim holtz inks, and copics.